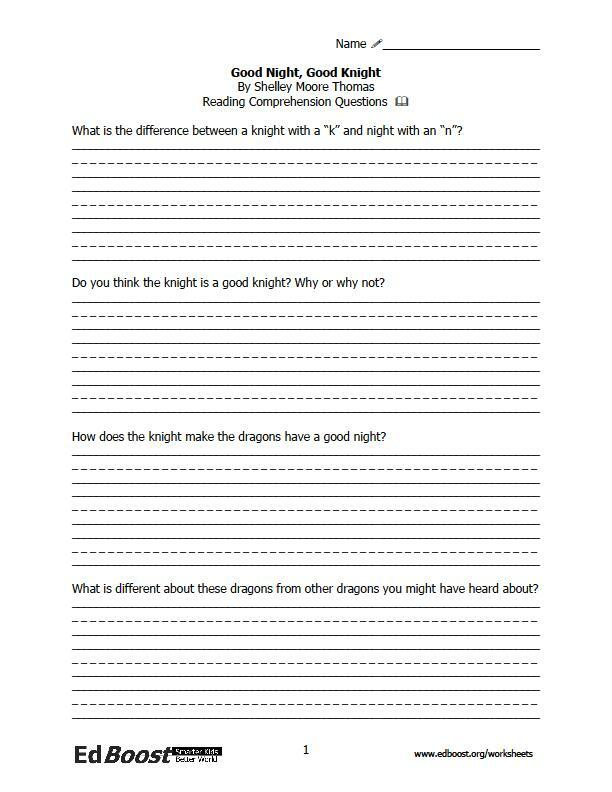 Reading comprehension packet and answer key for: Good Night, Good Knight by Shelly Moore Thomas Summary: Good Night, Good Knight turns everything you thought you knew about knights upside down. In this book, a good knight runs into three little dragons. He doesn't have to "slay" them or capture them; these little guys just want help falling asleep. So, the good knight plays daddy to the little dragons, because, after all, he is a good knight. Reading level: 1st grade. Themes: Knights and dragons, being "good," good night rituals. The book is cute and very sweet -- and kind of unexpected. Audience: This book is an easy reader, but a little more advanced than a "first step away from phonetic readers" book. It contains a lot of high frequency words and a lot of words that are easy to sound out, but it also contains a number of words that may be new for first graders. The words repeat (and often rhyme) making it easy for children to learn the new words. This book is a good one for multiple reads, striving for better and better fluency each time.